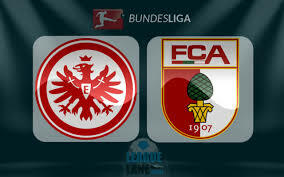 Eintracht Frankfurt hosts Augsburg in a match from the 29th round of the German Bundesliga. Here are our thoughts about this fixture in the city of Frankfurt on Sunday evening. Eintracht Frankfurt are currently 4th in the Bundesliga standings with 52 points won and a record of 15 wins, 7 draws and 6 losses. The club continues its fight for a Top 4 finish and a Champions League qualification. Right now Eintracht are having 4 points advantage in front of the 5th Borussia M’gladbach, so they are in a good position to chase a place in the CL. In their last five matches in the league Eintracht are pretty much perfect – five consecutive wins. In their last game Adi Hutter’s boys celebrated a difficult, but important 2-1 win during the visit to Schalke 04 at the Veltins-Arena. Ante Rebic opened the score for Eintracht, but Schalke equalised. The winning goal for Eintracht was scored in the 99th minute of the game, when Luka Jovic converted a penalty for the visitors. Meanwhile Augsburg are 15th in the Bundesliga with 25 points, fighting to keep their place in the elite division. Right now Augsburg have 4 points advantage in front of the 16th Stuttgart. They have a record of 6 wins, 7 draws and 15 defeats since the start of the season. In their last five games in the league Augsburg won twice, lost twice and made one draw. In their last game they suffered a crushing 0-4 defeat against Hoffenheim, which led to the sacking of the manager Manuel Baum. Against Eintracht the team will be managed by Martin Schmidt. Surely Eintracht are the big favourites against Augsburg. The team is very close to a Champions League qualification and they want all of their last five games in the league. But let’s see how Augsburg will perform with their new coach.